Really? How? No one was killed or even arrested when Russia blockaded the Ukrainian army and navy and seized important airports in the Crimea. But even so, what could a weakened U.S. do about it? And therein lies the rub – doing something about anything. Obama has so weakened our posture overseas that of course Russia will do whatever Russia wants to do, especially in its own sphere of influence. It wasn’t that long ago that the former Soviet Union included the Ukraine and the Crimea, a decidedly Russian province, which holds the key to Russia’s influence in the central Asian and southern seas: the warm water port of Sevastopol. For without that outlet, Russia would be forced to send ships (and influence) from high on the eastern Baltic Sea at St. Petersburg. The knee jerk reaction Putin exhibited when elected pro-Russian Ukrainian leader Viktor Yanukovych fled the Ukraine for Moscow, was that of a mama bear defending its cub. The history of Crimea is decidedly pro-Russian, and Putin is happy at any opportunity to expand mother Russia’s influence and resources. What is the Obama response so far? Impose sanctions on “individiuals and entities” responsible for Russia’s military takeover,authorized but not implemented travel bans and the freezing of assets, six F-15s in Lithuania, 12 F-16s and 300 troops in Poland, and a destroyer in the Black Sea; all that in response to Russia’s deployment of 30,000 troops.Ahem. The Obama administration’s tough talk on Russia’s invasion of the Ukraine is not backed by virtually anything other than tough talk. It would be profoundly unfair to law-abiding Russian citizens, many of whom have embraced democracy and capitalism quite successfully since 1991, to damage Russian Banks with western economic sanctions in an attempt to hurt Putin. And make no mistake, Obama’s current strategy is all about hurting Putin, his opponent, and with whom he is strikingly under matched. 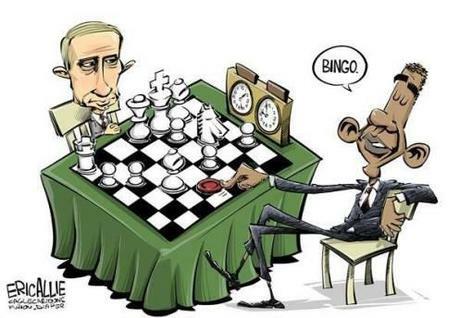 Vladimir is playing chess while Barack is playing checkers. They might as well play tennis, where, presumably, the president may have a fighting chance because currently he is not merely outmatched; he is in another time zone, physically and figuratively. While Obama was still asking who the heck Edward Snowden was, Putin was cutting deals with the American traitor. While Obama was in Washington watching Bob Costas’ eyes turn red in Sochi, Putin was back in Moscow negotiating an arms deal with the Egyptians. Check, check, and double-check! One more move and it’s going to be check mate! At the risk of grossly oversimplifying this situation, imagine if you would, a game of Risk. Would you ever, even in your wildest imagination, GIVE BACK territory to your opponent while seriously trying to win the game? Of course not! Why then does Barack Hussein Obama think he can win the geopolitical game of risk he’s playing now after apologizing for us, having given away Iraq, promising to give away Afghanistan, balking at enforcing a “red line” in Syria, allowing four Americans to be slaughtered in Benghazi, removing tanks from Europe, and proposing budget cuts to the military? Obama’s actions as Commander in Chief would be laughable if they didn’t make you cry! All the while, Putin is toying with his prey like a tiger with a mouse! “Easy to criticize, harder to come up with a plan that will work,” you say? How about this: first, turn back the clock and elect Mitt Romney. Remember him, the guy who said during the election debates that our most formidable geopolitical foe was Russia? Yeah, that’s the guy. Remember how Obama mocked him? Former Alaska Governor Sarah Palin warned about Russia as well and was completely trashed in the liberal media for it. Second, it’s the Cold War all over again apparently, with Russia supporting Syria and basically everyone else that we are politically allergic to. Then there’s China, testing limits to their east with disputes over Taiwan; Japanese waters and islands. Then of course there’s Iran, you know, the country we used to have sandwiched between Iraq and Afghanistan? A strong presence in Iraq, Afghanistan and the western pacific would send the message that expansionist ideas would be dealt with swiftly and decisively. Without power projection platforms in countries near disputed lands and a serious presence on the seas, we can’t influence diddly squat. Obama has us in retreat in every possible capacity. The chess game is lost. Risk is now unwinnable. Tennis anyone? Whatever anemic things Obama comes up with at this point (the Crimean government is holding a referendum on joining the Russian Federation later this month, will probably have adopted the Russian Ruble by then as well, and undoubtedly have already kissed their cousins, nieces and nephews in the Ukraine! ), will be completely inconsequential. The European Union does NOT have the stomach to make any meaningful retaliatory moves (certainly none militarily), so Russia is free to explore their options, which at this point appear to be UNLIMITED, courtesy of the man of the hour, Barack Hussein Obama. I am the author of “Saving Grace at Guantanamo Bay: A Memoir of a Citizen Warrior,” and am a three times mobilized U.S. Army Reserve Major (Retired). Follow me on Twitter @mjgranger1. This entry was posted in Uncategorized and tagged Afghanistan, Barack, chess, China, Cold War, Crimea, Iran, Iraq, Obama, Putin, Risk, Russia, Ukraine, USA, Vladimir. Bookmark the permalink.